In direct restorations of anterior teeth, particularly central incisors, symmetry plays an important role. The clinician can take advantage of silicone indexes based on a wax-up to build palatal and incisal walls; however, when he has to reproduce free-hand chair-side symmetrical items like interproximal emergence profiles, macro- and microsurface textures, and chromatic characteristics, the result can often be unpredictable. A step-by-step class IV restoration treatment will be described, as well as a simple procedure to help reproduce, check and correct symmetrically interproximal wall contours and chromatic characteristics. Soft tissue fenestration in implants is considered not only as a situation that could negatively influence the long-term stability of the implant, but also creates an esthetic problem when it occurs in the visible area of the mouth. This article describes the resolution of a case that presented a vestibular fenestration of an osseointegrated implant placed to substitute the upper right incisor, which does not respect the recommendations of ideal three-dimensional position in a young patient with a high smile line. The case was treated using two mucogingival surgical techniques to avoid a more invasive approach. A prosthetic immediate final abutment was inserted in the day of the second surgery. The fenestration was successfully covered and 2 years later it remains stable. In this article, the details about the treatment are described. The aim of this in vitro study was to observe the effect of hydrofluoric acid (HF) on the surface of two glass ceramics for Cerec and to compare it with the effect on a conventional glass ceramic. Discs were cut from a feldspathic ceramic block (VitaMKII) and from a leucite reinforced glass ceramic (IPS EMPRESS CAD) for Cerec. 5% and 9% HF concentrations were used during 1 min and 2 min each. Afterwards samples were thoroughly water rinsed for 30 s. Half of the 9% HF 1 min samples were subsequently submitted to a complex post-etching cleaning. All samples were observed under a scanning electron microscope (SEM). The conventional feldspathic ceramic samples were built up on a refractory die and a platinum foil. They were treated with 9% HF for 2 min and water rinsed for 30 s. Half of the samples were submitted to the same post-etching cleaning protocol. All samples were examined under SEM and EDX. The Cerec ceramic samples and the platinum foil ones were clean and free of any precipitate after 30 s of water rinsing. Acid concentration, times of application and the postetching cleaning treatment did not influence the cleanliness of the samples. A thick layer of deposit was observed only on the refractory die samples. This was only diminished after the post-etching treatment. The EDX analysis detected the presence of fluoride (F) only on the refractory die samples. The aim of this study is to investigate different instruments for finishing composite restorations, as well as examining different surfaces and interfaces of the same restoration. The null hypothesis is represented by the fact that there are no significant differences on roughness of composite restorations finishing between tungsten carbide and diamond burs, furthermore the null hypothesis is that there are no significant differences on roughness between finishing on composite surfaces (C), compositeenamel (CE) and composite-dentin (CD) interfaces. The study was performed on 28 teeth, and class V cavities were prepared on the extracted teeth. Restorations were done in Filtek XTE nanofilled composite (3M Espe) in a standardized method, to then be finished. A comparison was made in the phase 1 between tungsten carbide burs (16 blades), diamond burs (46 μm), with a similar shape by the same manufacturer (Komet). Each surface received 5 bur applications. Consequently, an analysis with a profilometer was performed. Phase 2 involved further confrontation of ulterior finishing with ultrafine tungsten carbide burs (30 blades) and with extra and ultrafine diamond burs (25 and 8 μm) (the same shape as previously mentioned). A second analysis was then performed with a profilometer. All measurements were taken on C surfaces, CE and CD interfaces. Statistical analyses were carried out with c2 test (a = 0.05). Conclusions: The finishing procedures with fine grit or toothing burs gave a better smoothness with tungsten carbide burs compared to diamond burs. While with the ultrafine grit no significant differences were noted between tungsten carbide and diamond burs on the CE and CD interfaces, the diamond bur left less superficial roughness on the C surfaces. With regards to the superficial roughness of the different areas of restoration, it can be concluded that: minor roughness was detected on C surfaces, while the CD interface had the most superficial roughness, regardless of whether the diamond burs or tungsten carbide burs were used. This study shows some statistical differences that could not be clinically perceivable. The clinical relevance could be resumed as follows: the fine tungsten carbide burs provided less roughness compared to a fine diamond bur. There were no differences between the ultrafine tungsten carbide and diamond burs. The less favourable interface to be finished is CD, compared to the CE interface and C surfaces. Objective: To investigate the influence of translucency of CAD/CAM ceramic milling blocks on the final color of porcelain veneer cemented using resin cement with two different opacities. Materials and methods: A standardized incisal lap preparation was made on a maxillary right central incisor that was duplicated using composite resin material (Z250, A4, 3M ESPE). The resin dies were individually laser scanned (Bluecam, Sirona) in order to build a 3D model of the porcelain veneer on the CAD software (Cerec 3D). Three types of milling blocks were used to fabricate the required restorations: multichromatic, high translucency, and low translucency milling blocks (IPS Empress CAD, A1 Vita shade tab). The milled veneers were polished, glazed, and bonded on the resin dies using high opacity and low opacity resin cements (Panavia F2.0). A digital shade guide device (Easyshade Advance, Vita) was used to measure color parameters (CIE Lab values) at the incisal, middle, and cervical third of each cemented restoration. ΔE values of the cemented veneers were calculated against the target color (A1). Results: Cementation of porcelain veneers resulted in significant color change of the resin die (A4) as ΔE values ranged between 8.9 and 13.7. However, the type of milling block did not have an observable effect on final color as the measured ΔE values, against original die color, were very close for the multichromatic block (ΔE = 10.7 ± 0.1), high translucency (ΔE = 9.7 ± 0.09), and low translucency blocks (ΔE = 13.4 ± 0.11). The opacity of the used resin cement did not affect the final shade match, as the observed ΔE values using either high opacity and low opacity resin cement were less than 2 for the three used ceramic blocks. The greatest color difference was observed between the incisal third of multichromatic veneers (ΔE = 8.9) and the cervical third of low translucency veneers (ΔE = 13.7), while for the rest of the test groups this shift was not clinically observable (ΔE < 2.5). 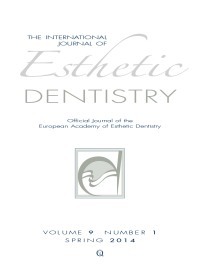 Conclusion: Within the limitations of this study, the shade match of CAD/CAM porcelain veneers was not influenced by the translucency of used milling block or the opacity of the resin cement. Purpose: To compare the fracture resistance between bilayered zirconia/ fluorapatite and monolithic lithium disilicate heat-pressed crowns and characterize the mode of fracture failure. Materials and methods: Thirty crown samples were sequentially fitted on a mandibular right first molar metal replica of an ivory prepared molar tooth. The crown specimens were divided in three groups (A, B, and C; n = 10 for each group). Group A consisted of bilayered zirconia/fluorhapatite pressed-over crowns with standard design crown copings (0.7 mm uniform thickness), Group B of bilayered zirconia/fluorhapatite with anatomical design crown copings, and Group C of lithium disilicate monolithic crowns. The samples were then dynamically loaded under water for 100,000 cycles with a profile of 250 N maximum load at 1,000 N/s rate and 2.0 Hz frequency. Loading was performed with a steel ball (5 mm in diameter) coming into contact with the test crown, loading to maximum, holding for 0.2 s, unloading and lifting off 0.5 mm. The samples were then fractured under static loading, in order to determine the ultimate crown strength. Analysis of the recorded fracture load values was carried out with one-way analysis of variance (ANOVA) followed by Tukey tests. Fractured specimens were examined by stereomicroscopy and scanning electron microscopy. Results: The fracture loads measured were (N, means and standard deviations): Group A: 561.87 (72.63), Group B: 1,014.16 (70.18) and Group C: 1,360.63 (77.95). All mean differences were statistically significant (P < 0.001). Catastrophic fractures occurred in Group C, whereas mainly veneer fractures were observed in Groups A and B. Conclusion: In the present study, the heat-pressed monolithic lithium-disilicate crowns showed more fracture resistance than zirconia/fluorapatite pressed-over crowns. Within the bilayered groups, the anatomical zirconia coping design presented increased ceramic fracture resistance.